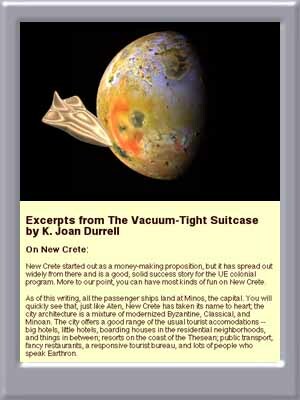 Excerpts from "The Vacuum-Tight Suitcase"
The first edition of The Vacuum-Tight Suitcase was written during the 23rd century, the "Golden Age" of United Earth, when UE was sole and undisputed government of a prosperous and reasonably peaceful collection of Terran races. But the late 24th century saw the introduction of psionic technology and the Psi War. The 25th century was one of reconstruction, then expansion, and the reconstituted United Earth no longer rules the Terran expanse alone. The current game is (more or less) set in the early 26th century, when the characters stop traveling through time and dimension long enough. Through it all, The Vacuum-Tight Suitcase continues to get printed. Either Ms. Durrell enjoys all the benefits of modern medical rejuvenation or her estate is on to a good thing. The current edition therefore includes historical notes on how the different worlds have fared since the Psi War.